We recommend taking scenic and mild rides through the heart of the region's wine country along West Side and East Side Roads. Also consider Joe Rodata West County Trail which extends from downtown Santa Rosa to Forestville. They all offer beautiful views of farms and vineyards. Coleman Valley Road from Occidental, over the hills and down to the coast is a top pick. In and out of the forest’s shade the scenic views are stunning and the road is virtually traffic-free. The whole family will enjoy these easy, safe and scenic rides. 1. Peddling through the old growth trees of Armstrong Redwoods. 2. Biking secluded Pomo Canyon. 3. Cresting the hills above Lake Sonoma. Forty-eight miles along official scenic Highway One, the Sonoma Coast ride starts in Bodega Bay and ends north at the seaside town of Gualala. 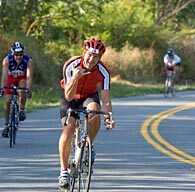 A rewarding ride for the seasoned cyclist. Three locations offer exciting rides. Salt Point along the coast features a rugged wilderness terrain; Lake Sonoma north of Healdsburg offers a labyrinth of trails among the hills and is host to races throughout the year; Annadel State Park is a wilderness refuge outside of downtown Santa Rosa. Explore miles of creek bottoms, ride past waterfalls, and power up hills in the back country of Austin Creek State Recreation.